To ensure your product arrives as fresh as possible, your product can be hand-delivered to any delivery address in the metropolitan Knoxville area. During the ordering process please select a date at least one day from the time you place your order. Hand-delivery is available on Saturdays to most local zip codes. Sundays and holidays are excluded. Orders placed by 5:00 pm Eastern Standard Time Monday-Friday can be hand-delivered the following business day by 5 pm. Under normal conditions, every effort is made to have your order arrive on your requested delivery date. However, please understand delays outside our control occur due to the following: weather, product availability, holiday rush season, rural area constraints, lack of response by the recipient, incorrect address information entered, invalid delivery date entered and other conditions outside our control. Although we will make every effort, we can not guarantee exact delivery times. An additional fee may apply for redelivery due to incorrect delivery information provided. Local pick up is also available at no charge. 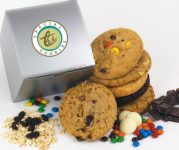 Special Tee Cookies ships all orders via US Postal Service because of its superior handling of perishable products, its ability to deliver on Saturdays, and its complete coverage area of all 50 states. Monday, January 21 - Birthday of Martin Luther King, Jr.
Special Tee Cookies is committed to bringing you a quality product shipped in a timely manner and handled with care. However, Special Tee Cookies can not take responsibility for delayed deliveries due to acts of God, heavy holiday shipping schedules, or incomplete/incorrect delivery information. We reserve the right to pass along any additional charges from USPS to the ordering customer resulting from incomplete/incorrect delivery information given by the ordering customer. Yes, but you will need to place an order for each address you would like to ship to. This can be done quickly and easily if you sign up for an account on our website. Your account will retain your billing information, allowing you to benefit from a faster checkout. You can do this with the Log In links at the top of each page or on the Check Out page. To make sure your gift arrives on time we may find it necessary to substitute an item of equal or greater value. If you have placed your order before 11:00 am Eastern Standard Time on a business day it will be shipped the same business day, unless you have requested delivery on or by a specific date. In that case it will be shipped accordingly. Business days are Monday through Saturday, not including holidays.